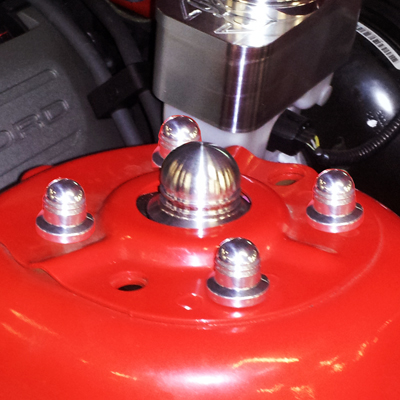 Innovative Bold Styling: Complete the Billet 'Look' in your Mustangs engine compartment with UPR's Billet Beehive Strut Tower Cap Cover Kit showing off a machine finish that is setting the industry standard! This 10 piece kit covers the top of both struts and the nuts surrounding them on both sides. UPR was the first company to introduce a complete line of billet and is still the leader in top notch dress up items for your car. Quality Construction: CNC Machined from 6061 Billet Aluminum for a perfect fit including the Diamond cutter final pass giving it the best finish possible. No one else gives you the bold clean styling of our Aftermarket Dress Ups, Suspension and Performance Parts for your American Muscle Car like UPR Products! Installs in 5 minutes or less. Fits these Vehicles: 2011 2012 2013 2014 V8 GT Mustang Steeda Roush & Saleen Vehicles. * Does not fit GT500. Made in the USA!